Valkyrie unsheathed her claws and narrowed her ice-like eyes. "How about I think about ripping off your pelt if you don't put away those claws?" She hissed lowly, fur bristled. "I'm here for one reason and one reason only; Quake. I know how much damn trouble she gets into and I wouldn't enjoy seeing her get her throat slit by Onyx," she stated and flicked her tail over Blade's face as she padded away sassily. Blade growled, but Blink simply narrowed her gaze when he glanced back at her. Don't even think about it. Crone chuckled low in his throat, flexing his claws and padding up to Valkyrie with a flirtatious purr. Valkyrie glowered at him and she hissed, "Flirt once and I'll do to you what twolegs do to the kittypets." Quake snickered, smiling at Blade. "Also, I can't tell if you were watching, but she picked a fight with us," she purred, going after Valkyrie. “Only because you’re both filthy Clan cats who don’t deserve the company of superior rogues like us,” Blade snarled. "Superior? Please," Quake laughed, turning around. "The only thing different between us is that you're under Onyx's command, and I'm here for the killing,"
Ic: Blade snarled. “You were so quick to abandon your Clans for the rogues, we cannot and will not trust you or your words, ever.” He spat at them, turning and stalking into a den to find a nest. I abandoned them long ago, Quake thought dryly, before continuing her quick walk over to Valkyrie. "Do you think we should just go?" she sighed, turning her head to look at the entrance to the camp. Valkyrie flicked her tail and sat down. "I don't know. I don't want to force you to leave," she meowed, flattening her ears and ducking her head. Mochi padded inside what used to be FireClan's nursery. She purred to Mango, who lit up when she came in. "How was the battle?" Mango asked. Mochi sighed. "Not so good. I think I did okay distracting them though." SHe said. Gumdrop leaped onto Mochi's back. "We missed you!" Gumdrop squeaked and Mochi laughed. "I missed you both as well." She said, looking at Gumdrop and Flash. Ryu dashed over to Syrah, his neck fur standing on end. "Are you okay?" he asked worriedly, rasping his tongue over his sister's shoulder. Syrah pressed her head against Ryu's, smiling. "I'm fine, just scratched on my back leg," she purred. Frostbite watched the commotion from a distance, simply tearing into her food. Aether sat at the side of the camp, grooming himself, while Karma walked back in, one ear still dripping slightly as she dropped the two mice she'd caught. She took one for herself, leaving the other for anyone else. Mochi dropped her fat bird. "I brought prey for us." She said. Mango purred. "Thank you!" She said and started eating. Her kits and Mochi joined as well. Onyx barely lifted her head as a deep rumble sounded in the distance, scenting in the air the slightly metallic taste of rain and lightning. "Hmph," she mewed aloud, getting up and only when she padded out into the moonlit clearing realising that her right eye had swollen shut. Blast. "Tessa?" she called out sharply to the healer, padding towards the scent of herbs and into the medicine den. Tessa blinked her eyes open as Onyx called into the den. She quickly got up to her paws and flicked her tail. "Yes, Onyx?" She meowed, hoping to hide her nervousness of the powerful rogue leader. Fuji snored, one eye drowsily opening as he noticed Onyx enter the den. He scrambled up to a sitting position, dipping his head from behind Tessa towards Onyx. Kia slipped into camp with a mouse, and sparrow, hanging from her jaws. She immediately delivered them to where Min slept, dropping the plump mouse at her paws. "When do you plan on finding Deadpool's group?" She meowed, remembering her intentions the day before. Aleser frowned at the two newer she-cats' behavior. No respect at all. He wondered, narrowing his eyes as he watched Blade confronting them. Mochi ate her share and walked out, holding the unneeded bones of the prey. She deposited them to the side and stretched out in the clearing. Solar watcher over Lunar, who was limping to get food due to her injury. Onyx simply flicked an ear in Fuji's direction, turning back to the healer. "I can't see out of my right eye," she mewed, turning her head to show the oozing gash that covered the side of her face. She hardly jumped as a crack of lightning split the sky, followed almost immediately by another thunder boom. Tessa used all her strength not to run off from the gruesome wound that was displayed in front of her. She nodded slowly. "That is a bad wound you've got there," She paused, licking down her chest fur nervously, "I-I think you may have lost your eyesight in it, forever." The russet red shecat dipped her head, before padding over to where the herbs were stocked. She promptly pulled out a few different herbs, and nodded to Fuji who was bringing a swab of cobwebs in his jaws. "Stand still," She instructed, before dripping a chewed up flower, otherwise known as celandine, over Onyx's injured eye. Still need to add the chervil, and cobweb, she reminded herself. Fuji stood by, observing with admiration, as well as disgust, as Tessa worked on Onyx's wound with certainty. He spat out the cobwebs after a while of holding them in his mouth, and situated them onto his paw. The large, gray tom, would never be thought of as a medicine cat at first glance, although he did delight in his job moderately. Tessa flinched slightly at Onyx's response, and hurried along to spread the chervil on her eye. "Almost, I just need to stop it from bleeding more," She explained, "You don't want to lose more blood, it'll make things worse." The young shecat nodded to Fuji as he stepped forward, placing the cobwebs over her eye. Tessa flicked her tail. "Just, remember to be careful with it, otherwise it could break open again," She instructed, although she reminded herself that Onyx was probably too proud to listen to her. Onyx nodded but didn’t speak, not even thanking the cat as she turned and left, walking into the pouring rain and howling wind. Min winced as lightning crackled through the sky. Her nose was buried in her fluffed up tail, and an overall eerie feeling hung over the camp. She looked up slightly as Kia padded in with a mouse. "Good catch," she huffed, sitting up fully and straightening her back. "We'll go tonight if the storm decides to let up." she meowed, taking a small bite from the prey and chewing it slowly. Ryu nodded, touching his nose to Syrah's cheek. He bunched his muscles at the sound of thunder but didn't move. As the rain began to patter down and slick down his fur, he ducked into one of the dens and plopped into a nest. Even though the storm was howling outside, he had a feeling of complete peace. But he didn't stay in that state for long, and he started thinking about a possible attack from the Clans. Kia gave a small nod, her gaze flicking over to the pouring rain outside. She twitched her whiskers, not wanting to get wet, so instead she pushed a clump of moss in the back of the den, and crouched down, munching on the sparrow. Min traced her claws across an empty moss nest next to her, beginning to remember her times in the old Twoleg nest with Shard and Deadpool. She bared her teeth at the memory of her old mate, but felt strangely attracted to go see him. She got up and shook out her fur, swallowing the last of her mouse. "I can't wait, I'm leaving now." she meowed to Kia. "Let's go." She clearly took no notice of Kia's exhaustion and the danger of the storm outside. "Maybe we could capture a medicine cat from one of the Clans." Shard suggested to Onyx, "So you don't have to do all this yourself. Kia let out a quiet sigh as she got to her paws, and followed Min out the den, her half-eaten sparrow left behind. She flattened her ears as the rain pelted down onto her, causing her fur to grow darker, and soaking wet. I'm at least glad Onyx had the mind to choose a campsite in the woods so we don't get poured on. Shard thought, crawling into her den and trying to ignore the mud sticking to her paws and the blood on her pelt from the battle. Blink glanced up as Shard slunk in, rolling her eyes a little. Stupid cat. Onyx rested her chin on her paws in her own den, watching the ivy with her one clear eye, the other foggy. The anger bubbled only a little at first, but soon grew into a wildfire, making her leap up to claw the climbing plant off of the rock with her claws grating against the stone. Useless thing, not worth my time. We will attack tomorrow, and it will succeed. Flavia twitched her whiskers and she padded over to Onyx's den, ignoring the rain as it poured down onto her pelt. She poked her head inside, her ears twitching in amusement. "Do you have a plan? Or are we just being lead into battle blindly?" She meowed, her gaze sharply focusing on Onyx. I cannot allow her to ruin my group, just so her's can succeed. Onyx growled lowly at the other cat, lifting her head so Flavia could see the bandages covering her eye, damp from the rain and turning slightly pink. "No need for the cruel jokes," she spat. "Get out." IC: Flavia flicked her tail and slipped out the den, her chin held high up. The white and golden-pointed shecat rushed into the nursery, as it was the comfiest den, and plopped down into a nearby nest. Min sat in a dark corner of camp, the wind occasionally blowing rain into her face. Her right eye twitched as she watched Flavia hurry into the nursery. Mouse-brain. She is on the edge of getting herself and her group kicked out of here. She's inferior. She needs to respect Oynx. she thought, curling her tail over her paws and turning her gaze to the camp entrance, darkened by the ivy growing across the stones. Tessa flicked her tail as she helped the last of the wounded cats, and noticed Min in the corner. "I'll be going inside," She meowed, although worry was hinted in her tone, "You shouldn't stay out too long, you'll catch a cold, or worse." Hopefully she listens, The russet red shecat wondered, then shook her head, reminding herself, These cats won't take a single scrap of advice from a medicine cat! Its D A W N Now! The storm is easing up, but a new chill sits in the air as leaf-fall's true hold begins to take. Prey will begin to become harder to catch; please make sure to remember this in the RP! A group of cats will go and attempt to steal kits from BrightClan, against orders from Onyx. Mochi padded out of the old elder’s den and growler. “Can it get any colder?” She grumbled and shook off some dew from her pelt. She grabbed a small piece of prey and walked over to where Mango was. Gumdrop scented Mochi and smiled. She slapped her brother with her tail. “She’s bringing prey!” She said and ran out. Mango yawned and puffed at er kit’s enthusiasm. Flavia stretched and slipped out the den, huffing as the cold breeze ruffled her fur. She narrowed her eyes as her breaths created puffs of white "smoke". "We're all going to be killed with this leaf-bare, and fighting Clans every sunrise!" She muttered out loud. Blaze, who had been sitting outside of the den because he didn't fully trust all these new rogues, turned his head to look at Flavia. " Tell me about it." He flicked his tail angerly, keeping his voice low. " I'm all for a good fight once and a while, but she makes us fight clans with cats that.. that can come back alive, way to much." He shakes his head, remembering Ivorystar. BrightClan: Nightmoon, Springpaw, Barkwing, Mudwhisker, Dovefeather, Ivypaw, Lightningpaw, Storkkit, Eagleflame, Seabreeze, Azureflame, Wishflight. 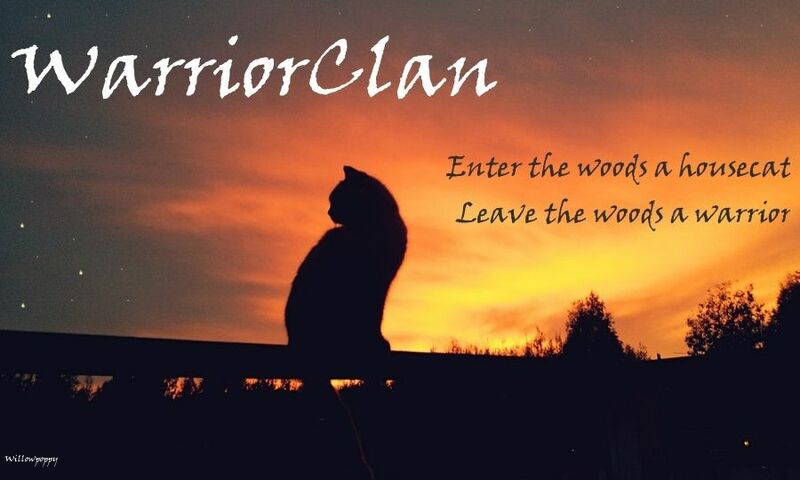 FireClan: Darkshadow, Ravenheart, Sedgekit, Sunflight, Fawnshadow, Wolfkit, Cougarkit. I'm crying out for help yet no one notices.. That is how it goes. Min huffed, waking from her spot in a corner of camp. She overheard Flavia and curled her lip in a snarl. "Trust me, you'll appreciate us a lot more once we take over the Clans. If you were our leader we'd send attacks every two moons and never get anything done. Oynx has something planned to help us get more hunters for leaf-bare, anyway." Umbra padded into camp stealthily, a mouse and squirrel hanging from her jaws by their tails, flicking her tail and setting them in the prey pile. She flexed her claws, looking around for Viciari.